So, like most of my questions, this one’s a finishing one…. The Mrs. has recently been making acrylic paintings on canvas, and has started to sell them. 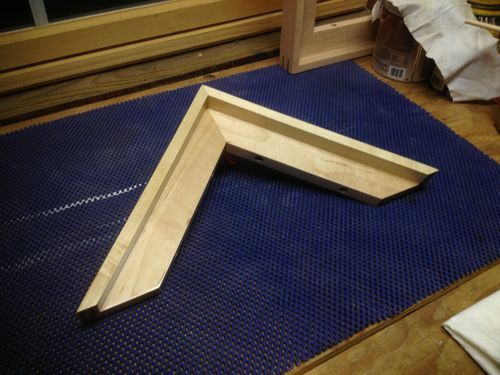 And, of course, I’ve been “commissioned” to make frames for them. I’ve been making a few sample frames (just corners), like the one in the first four pictures above, for her to choose from for the different pieces of art. 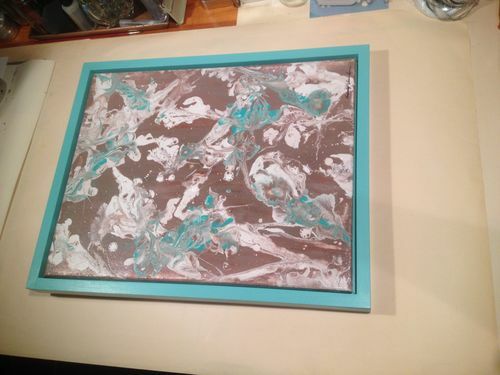 The type of frame is called a “floating frame”, and with the artwork attached, it will look like the last picture above, in the teal painted frame. So far, the samples I’ve been making are poplar painted black, poplar painted white, maple with tung oil, and red oak with tung oil. And, now, on a Maple frame sample, I’m trying a finish that I saw in Fine Woodworking, which is basically coats of Zinsser SealCoat (dewaxed shellac) followed by a stain used as a glaze, followed by more SealCoat to seal it. The link is https://www.finewoodworking.com/2018/01/26/great-finishes-pop-figure-maple if you’d like to see it in detail. Anyway… after putting on several coats of the SealCoat (dewaxed shellac), I’m supposed to use stain as a glaze over that. What I’m not sure about, and what I’m asking here, is do I need to sand or rub out the last coat of SealCoat, again being dewaxed shellac, before applying the stain as a glaze, or do I just straight up apply the stain? Part of why I’m wondering is that finishing a piece like this, there’s a lot of edges that make it difficult to get a perfectly smooth coat of the SealCoat on it without getting some runs here and there. It’s easy enough taking care of runs between coats since it needs to at least be scuffed, and runs can be leveled out then. But, between the SealCoat and the stain…? It was less than clear to me in the FW article. 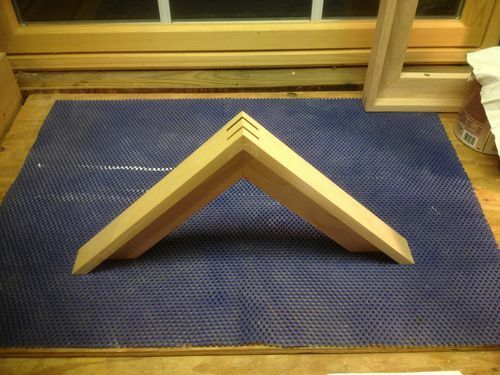 The corner frame piece shown above is maple with the SealCoat on it. No stain yet. Can you spray lacquer? If you can’t spray, I would use wipe on poly. The article doesn’t mention scuffing before staining. Also, as it mentions being able to wipe the stain clean and starting over, that suggests a smooth surface since, if you were to scuff it, stain would remain in the scratches. If it were me, I’d stick with dyes and lacquer. Sher-Wood CAB acrylic is easy to spray and is crystal clear, so whatever you put under it shows through. It’s also available tinted in any of their colors in the case where you want a solid color. 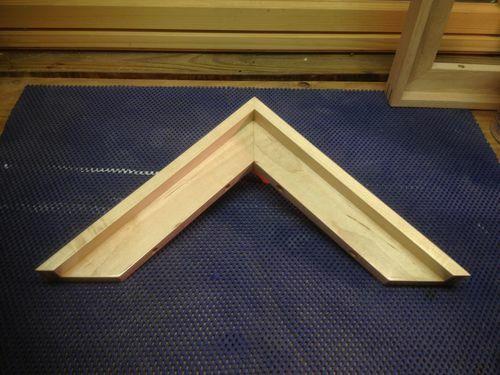 You could still accent those beautiful features in your frame with a glaze. Wipe it on and wipe off the flat areas, leaving the color to bring out the 3D effect. 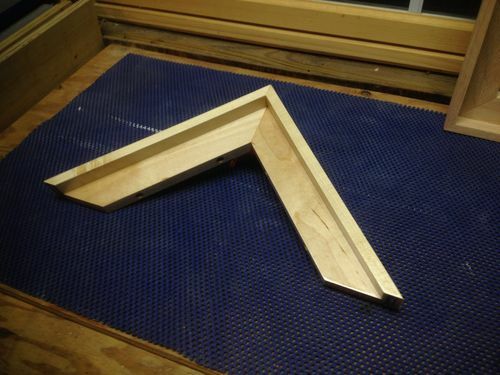 I am doing this process right now on a bed that I am building for my son, and it works pretty good. I am staining the poplar bed with General Finishes Java Gel Stain. To preclude the poplar from looking blotchy, I used Seal Coat on it first. But, to allow the stain to actually penetrate the seal coat, you have to cut the shellac down. It comes in the can as a 2lb cut. You need to mix the shellac in a 1:1 ratio with denatured alcohol and stir it up. That will dilute the shallac to a 1lb cut. This will make the seal coat much thinner, and allow the stain to actually penetrate into the wood. However, it does a good job at slowing the absorption in the areas that the poplar would normally blotch, as those have been pre-prepped with the shellac. Also, because the mixture has been thinned, any runs won’t be very noticable because of all of the alcohol that evaporates out. I have found most, if not all, of the liquid get absorbed into the poplar. After the shellac is applied, I give it about an hour to fully cure and then hit it with 320 sandpaper just to take down any areas where the grain may have raised. I then wipe it down with mineral spirits to get rid of any dust, and then start staining. It really does look good afterward. After 2 coats of the stain, I have been using General Finishes Arm-R-Seal. It works very similarly to their polyurethane, but it is oil based. It takes a little longer to dry, but I think it gives it a higher quality look than the poly. I also think it doesn’t yellow as much as poly normally does. Sounds like you just want to stain maple without blotching. The best thing is to use a conditioner, read about them here.. Can be topcoated with most any finish. Glazing is more for accentuating the design (more color in corners, knots, etc) and or some color, even or uneven, over the entire surface, but isnt the best for grain enhancement. Dyes and stains are best for that. They can all be combined as well. Rather than following the FW article what look are you trying to achieve? From reading the article it appears the intent is to achieve a smooth glossy finish then wipe the stain, then dry brush and leave the amount desired. This will probably require rubbing out the brushed shellac. Something like this is much easier to spray which will leave a better finish. Brushing the shellac over the stain my well move the dried stain around. I did a similar type of finish on some cabinets and a table. I posted it as a project (with pictures) here. The real time and effort was in the finishing. I sanded to 320 grit then put on a water based dye. Sand 320 again. Put on a coat of 100% de-waxed shellac (sanding sealer). Sand 320 again. Put on a gel stain and wipe off. No sanding after that, but another coat of sanding sealer. Then another 320 sanding. Then 3 coats of water based polyurethane with 400 grit sanding after the 1st and 2nd coat. I only put a single coat of sanding sealer on over the dye, before the stain and then sanded. Not so much to scuff the seal coat, but to expose some parts of the grain for the stain to penetrate into without obliterating the underlying dye. I’ll probably be doing this again in a couple months for another piece of furniture. I’ll try to get pictures of the finishing process. Thanks for everyone’s feedback. I’m sorry about the delay in responding. Things have been a bit hectic here lately. I was thinking that this might not be the best finish for this. It is, after all, just a sample, but if my wife wants this particular finish on a frame for some of her artwork, I’d have to do it on more frames, and if I can’t make it work on the sample, it’ll be a no go. But, a couple of things…. First, something I’ve seen and wondered about though is the Preval sprayer reviewed here… http://lumberjocks.com/reviews/2522 by David Grimes. I’ve wondered if this would help. Secondly, the FW article said to apply the SealCoat straight from the can, but I’ve seen a video that I find very interesting at https://www.woodworkerssource.com/blog/woodworking-projects/video-the-perfect-wood-finish-for-dark-hardwoods-try-this/ where SealCoat is thinned down by 25% with DNA, and they also add a small amount of mineral oil to “prevent streaking”. It’s applied by both pad and brush and supposedly runs are “self-fixing” during application with the pad. He starts talking about the SealCoat at about the 1:44 mark. The mineral oil in the mix needs to be removed afterwards with naphtha however. - I wish I had a spray setup, but I can’t justify it right now. That would make a lot of finishing a lot easier. See my comment about the Preval sprayer above, though. - Correct, the article doesn’t mention scuffing before staining. If I could pull off a run free SealCoat coat before glazing with the stain, I think I’d be ok to go ahead with the stain, but I haven’t been happy with the runs I’ve been getting from applying the SealCoat with the brush. I did wonder if I could or should rub out the last SealCoat coat to try for a nice scratch free surface before the stain. Of course spraying the SealCoat may eliminate that problem, but I’m not equipped to do that, unless I used something like the Preval sprayer that I mentioned above. Also, maybe I could try an additional “last coat” using the method mentioned above, thinning the SealCoat down with DNA and using a little mineral oil. I was thinking about the lacquer idea, too. I’m guessing if I did it that way I’d just substitute the lacquer for the SealCoat, first putting on the lacquer, then the stain as a glaze, with a final protective lacquer coat? I was just looking for something to add some depth, and maybe just a little color. You mentioned dyes… I haven’t worked with dyes before, so I’d have to learn about that before trying it. Thanks for the info. That sounds like a good process. I’ve used the General Finishes Java Gel Stain once before on a jewelry tree for my wife. I like that dark color. I bet it’ll look great on the bed you’re making. I’ll have to keep in mind thinning the SealCoat down for future projects. The video I mentioned above thins SealCoat (dewaxed shellac) down by 25% with DNA. Do you do a single coat of the thinned down shellac or multiple coats before the stain? I wish the FW article hadn’t said to use the SealCoat straight from the can. Thank you very much for that finishing discussion link. That’ll be very helpful to me! I’ve only been able to skim through it so far, but I definitely need to read it in detail before I figure out what my next step is. Basically, I just wanted to find a finish that would add a some depth to the grain and maybe just a little color, though not too much as I wanted to keep it on the lighter side. That’s a great looking project, well done! Thanks for sharing your process. It’s very helpful. I have used Minwax Pre-Stain sanding sealer before and liked the way it prevented blotchiness in stain applied afterwards. I went with the SealCoat this time, because I was trying to follow the FW article directions, but at this point, I’m not sure if it’s the best finish for these frames. I have to think it through a bit.